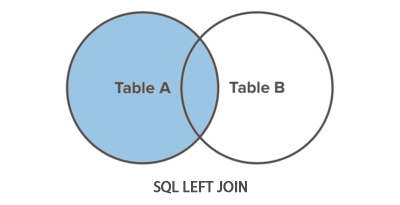 In this tutorial you'll learn how to retrieve data from two tables using SQL left join. A LEFT JOIN statement returns all rows from the left table along with the rows from the right table for which the join condition is met. Left join is a type of outer join that's why it is also referred as left outer join. Other variations of outer join are right join and full join. The following Venn diagram illustrates how left join works. Now, let's say you want to retrieve the id, name and hire date of all the employees along with the name of their department, irrespective of whether they are assigned to any department or not. To get such type of result set we need to apply a left join. The following statement retrieves employee's id, name, hiring date and their department name by joining the employees and departments tables together using the common dept_id field. It also includes those employees who are not assigned to a department. As you can clearly see the left join incldes all rows from the employees table in the result set, whether or not there is a match on the dept_id column in the departments table. Note: If there is a row in the left table but no match in the right table, then the associated result row contains NULL values for all columns coming from the right table.